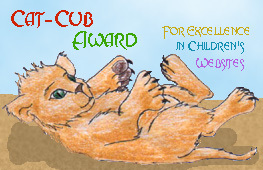 Welcome to the ThunderCubs Website - a ThunderCats site specifically designed with the Thundercub in mind! This site is still in it's construction stages, but the site is beginning to come along. This site is not official or affiliated with ThunderCats or those who own ThunderCats in any way. ThunderCats are copyright Ted Wolf, creator and co-owner, and Warner Brothers, co-owner. Because this site is being designed for cubs, the content on this site is G and PG-rated. Content on sites that are linked to should be G-rated as well, but because of how quickly things change on the Internet, cubs should remember to ask an adult before leaving this site. You can click on the options on the left to explore the site. Not all of the pages are up yet, so you may not find content in all areas. Please be patient, and thank you for stopping by!